Trainer for Gymnastic Arts, National Sportsman, Gold Medal in both Solo and Pas de Deux in Istanbul and Turkish National Championships. Enrolled in Istanbul State Opera and Ballet in 1986, Erdal Atik has taken roles as ballet dancer, repetitor and choreographer in many pieces performed from then until 2008. Founder/dancer in Türkuaz Modern Dance Company in 1989, performed in all pieces until the group until the last year of the company. Tango-couple dancer and principal dancer in Evita the Musical. Taken place as either dancer or choreographer in countless commercials, movies, TV series, local and international events. 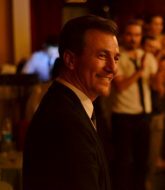 Erdal Atik is currently training individuals and groups on Argentine Tango, Nuevo Tango, Body&Dance Formation, Contemporary Dance, Contact Improvisation, Partnering techniques. He also performs Tango, reinterpreting it by modern dance techniques. Working with tango trainer Nora Þigaher, Erdal Atik is sharing his knowledge, experience and choreographical work not only by training dancers, actors/actresses and artistic performers but also by delivering classes to anyone who wishes to start dancing. Eleonora was born in 1977 in Istanbul. Even as a kid, she always had a great love of music and dance. In her high school, she was a solo singer in the choir and performed every year in dance and music groups. Nora is founder and main instructor of Argentine Tango, Women’s Techniques and Stretch&Condition courses at contacttango IDC..